Consumers love the perceived value of bundles. As a merchant or manufacturer, bundles allow you to increase order size and improve profitability which helps to offset shipping costs. Beyond profitability, they allow you to expand your product mix, introduce loyal customers to new products and promote unique SKUs/ASINs that no one else can offer. Bundles are a true competitive advantage. The benefits of product bundles are undeniable, but the pace of eCommerce and the decentralization of digital retail have made traditional bundles a challenge to cost-effectively manage. When shipping to Amazon, you have to guess which products will sell well together and pre-bundle them for fulfillment. Not only does this add expense, you may also end up with long-term storage fees from Amazon for bundles that don’t sell quickly enough. Another option would be to use internal resources to fulfill bundle orders from your own warehouse, but do you have the infrastructure to break down pallets or cases and accurately manage your inventory? Are you able to adequately scale and build volume as your business grows? 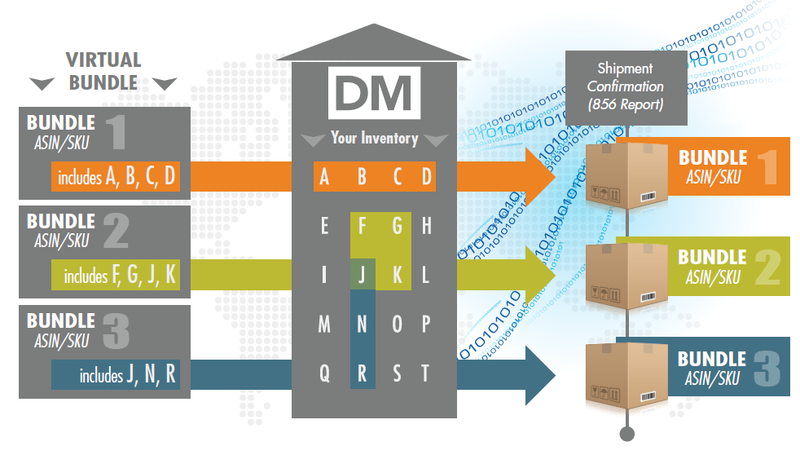 Partnering with DM Fulfillment is your answer. Our Virtual Bundling capabilities allow you to immediately go live with an unlimited number of bundles made up of an unlimited number of SKUs, all while systematically managing your inventory at the item level for accurate inventory reporting. We eliminate the need to physically pre-bundle products, streamlining inbound order flow, order reporting and inventory management.